It’s that time of the year that many students including myself dread or some may be excited for as it means that Summer is round the corner, another academic year is over. Yes, it’s exam season. I’ve written this post to share a great revision exercise for students as we prepare for our forthcoming exams. Even if you are not a student there is something to be learnt. If you have not done so already (or if you just want to refresh your mind), check out last year’s exam season post : Do your BEST and He’ll do the Rest. 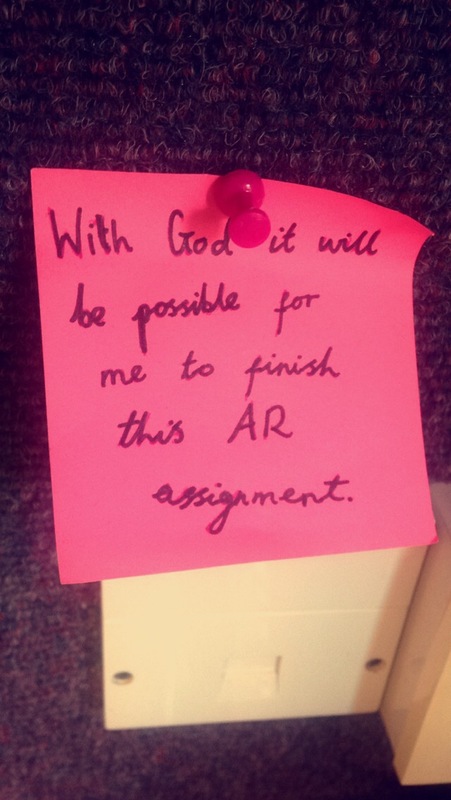 After that day every time I sat down at my desk to write the assignment, I would notice the post-it which reminded me to commit that session to the Lord. Now I urge you to adopt this little activity (revision tool if you like) or adjust it to your preference for the upcoming weeks or months. In your study area put up post-it notes of encouragement with bible verses to encourage you when times are hard and you feel like giving up. Let it be a reminder to commit it all to the Lord so that the burden is lighter. Cultivate a habit of committing your revision, coursework/assignment deadlines and exams to the Lord. The bible says: Commit thy works unto the LORD, and thy thoughts shall be established. (Proverbs 16:3). I prefer this translation which is self-explanatory: Commit your activities to the LORD, and your plans will be achieved. Everything you do towards preparation for your exams commit it to the Lord. I can honestly say that after committing my assignment to the Lord, He directed my research and directed my eyes to the right places where the answers were, He gave me new insight into the questions I was answering and an overall peace that it would eventually be completed to my satisfaction. When you commit your actions and activities onto the Lord, the difference is evident. I pray that the Lord will enable me to cultivate a habit to commit all things to him. As I commit my revision, preparation and daily activities onto the Lord I pray that they shall be successful. May I remember to cast my cares and worries upon the Lord, for He truly cares for me. As I cast my cares on you in prayer, please Lord don’t let me leave with them and put them back on my shoulders. Holy Spirit remind me that I have committed my ways and cast my worries on to the Lord and in return I should honestly leave it in His hands. In the midst of the stress of preparing for exams (or just life itself) let me remember the words of David: Cast your burdens on the Lord. And He shall sustain you. (Psalm 55:22). God honestly wants to carry our burdens, often times we want to continue to bear them on our shoulders even though we have said we are trusting him. Trust that the same strength that sustains you will also carry your burdens. If you want to reach new levels of faith in your life, you need to make a habit of committing things to the Lord. Committing things into God’s hands has to become part of your lifestyle. It differentiates you from others around you. Others will be stressing out but you will be resting on the promises of God; you know that He is in charge and He’s got your back. I wish you all the best in your exams! 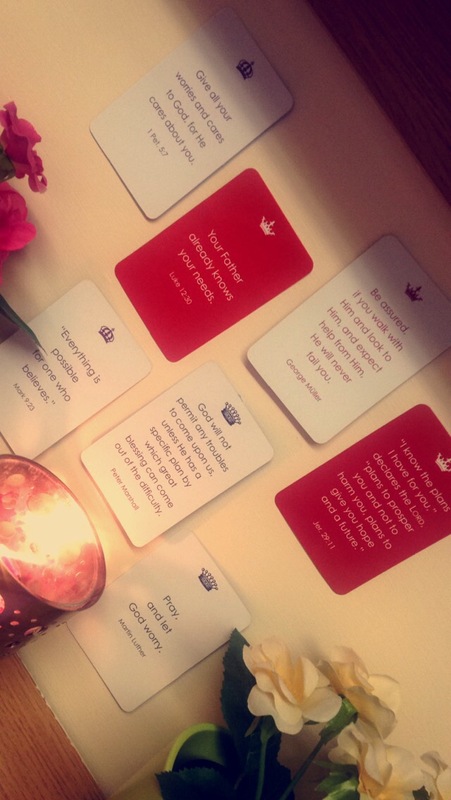 P.S – Don’t forget to check out last year’s post for exams, It has more prayers and one specifically for procrastinators. Do your BEST and He’ll do the Rest. So the exam season has finally arrived. 😳 The nerves may have kicked in and the butterflies may have begun to flutter in your stomachs. I just want to encourage you in this post, so that you’ll be able to face these forthcoming exams knowing that God has got your back. The bible clearly says in James 1:5; “If any of you lacks wisdom, you should ask God, who gives generously to all without finding fault, and it will be given to you”. This is one of my favourite promises in the bible. I pray that the Lord will give you the knowledge and understanding in order to be successful in these exams you are about to sit. All your efforts, late nights, all nighters and neglecting of your social life will be crowned with success and shall not be in vain. In Timothy 1:7, we are told “For God has not given us a spirit of fear and timidity, but of power, love and self-discipline”. My prayer with regards to this is that any spirit of fear, anxiety, worry or even procrastination in relation to your exams shall be deleted by The Lord himself In Jesus Name. When you think about that subject that you are struggling with, maybe its the knowledge aspect or the application aspect, think about God’s ability. Is anything to difficult for him? No! As you are well aware “With God all things are possible!” Ask him, to help you in that subject, to give you retentive memory, and through him excellence and success shall be yours. Adopt a belief that God is able to do abundantly more than you could ever think, ask or imagine concerning that paper and subject. In the same way God granted Jabez’s request, he shall also grant your requests In Jesus Name. Oh Lord, I pray that you will guide me. Please help me set good time priorities and stick with them. Give me self-discipline. Empower me to ask others for help when I don’t know how to get started or how to finish up. Give me confidence in my ability to do big tasks. Help me to overcome the temptation to do other things that I’d rather be doing that are less important. I know that you want me to live a healthy, productive life. Help me learn how to break this habit. Empower me in my weakness. Bring me back when I stray. Focus me. Organize me. Remind me. Energize me. Amen. I saw this little prayer and wanted to share it with you, even though it has a little humour the words in it should still be what we pray about to The Lord. He leadeth me beside the water cooler for a study break. I will not have a nervous breakdown For thou art with me. Surely passing grades and flying colours shall follow me. All the days of my examination. And I shall not have to dwell in this sixth form forever. Now, I leave you with this, Do your best and leave the Rest to God! Nothing and I repeat nothing is too difficult for Him to do for you, you just have to believe that. I wish you all of God’s blessings as you sit your exams.